I know what you might be thinking. Reading the entire Bible in two months sounds crazy! But it’s for real. People are reading—and loving it! But let’s answer the question: Why should we even consider this idea? 1. Big goals are more attainable than small goals. Do you know why people fail to read the Bible in 365 days? It’s too easy. That’s right. Reading two or three chapters a day is so easy that it’s actually difficult. About the only easy thing I can successfully do every day is brush my teeth. But immersing myself in a big time challenge for 60 days? I can do that. And you can too. Over the past year I’ve taken hundreds of folks through the journey. Do you know why people crash in Leviticus during a standard one-year Bible read? Because the text can seem like quick-sand. You start reading about burnt offerings and two weeks later you’re still in the book reading about… sacrifices and toenails. So you wonder, Is the rest of the Bible like this? With the 60-day plan, you’re in and out of Leviticus in two days. It’s an experience that makes the Bible feel more familiar and smaller. So small that you’ll want to read it again with fresh eyes. And that’s the point, right? People often say the Bible is just a story. Are they kidding? The Bible is not a story. The Bible contains a story. There’s a difference. The Bible contains data, genealogies, geography, challenging poetry (challenging for average readers like me) and many stories. But weaving in and out of all these sections are pieces of the overall story. Reading the Bible in 60 days helps you to see the Bible’s big storyline more easily. If binging on social media makes people depressed (that’s what the researchers say), the Bible makes people feel good. Consuming social media shows you what others are doing and how great life is for everyone else. Reading the Bible reveals what God has been doing and how rich your life can be in Christ—and will be in eternity. Social media obsession breeds discouragement, discontentedness, and distractions. Reading the Bible breeds hope, peace, and vision. The Christian life is not a to-do list. But lets face it, for Christians, reading the entire Bible should be on a short list of lifetime spiritual goals. 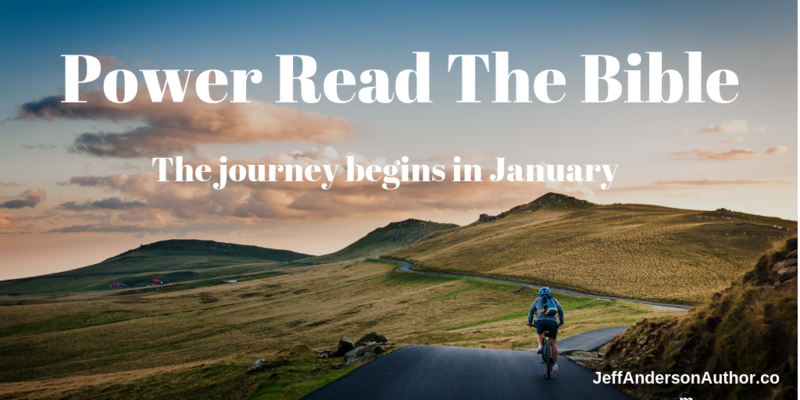 So if you want to read the Bible because you never have, the 60-day adventure is for you. And by the way, I don’t believe reading the Bible will be a one-and-done experience for you. You’ll want to do it again—and wouldn’t that hunger be remarkable? On one end of the spectrum of Bible engagement, there’s scripture memory, meditation, and deep Bible study. Think of “Power Reading” as the complete opposite end of the spectrum. Power reading is fast-paced—flying through the pages. Instead of soaking in God’s word, like sitting in a hot tub, you’re running through the rain! Power reading is a special form of Bible engagement which delivers important benefits that you’re probably not used to. It’s not necessarily better. Just different. And for many people needing a spark in Bible reading, different can be better. Reading the Bible aggressively for 60 days will require you to find at least an hour a day to read. (That’s all!) This means spending one hour less on something else: less sleep, less TV, less social media, or internet surfing. Most people welcome the opportunity to focus, and reorder their life priorities for things that matter—like reading the Bible! How about you? Reading the Bible in 60-days will require lots of time in God’s Word. And that’s good for you. If you’ve ever thought about doing a “juice cleanse” or a short-term nutritional detox, it’s sort of like that. Consuming a high-calorie Bible diet means thinking more about God, eternity, holy living—and being more aware of God in our everyday lives. Who doesn’t need that? If parents ignore the Bible, they’ll raise children who don’t care about God’s Word. If young single adults don’t read the Bible, they’ll attract others who feel the same. Reading the Bible in a short period actively attracts the interest of others. For parents, Bible reading means kids who notice your time investment and are interested. For single adults, being in a Bible reading challenge generates curiosity in others.